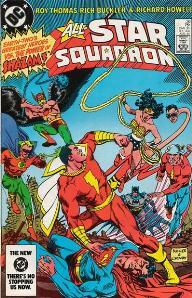 Cover of All-Star Squadron #31 (March 1984). Art by Jerry Ordway. The All-Star Squadron debuted in a special insert in Justice League of America #193 (August 1981). The new team was launched in its own series the following month and was created by Roy Thomas, Rich Buckler and Jerry Ordway. The eponymous comic book series was published for 67 issues from September 1981 to March 1987 and three annuals were published as well. When Rich Buckler left the series after the fifth issue, editor Len Wein hired Adrian Gonzales as a replacement and notified Roy Thomas with a note stating "You're going to like Adrian Gonzales". He drew the series for 13 issues which included a crossover with the Justice League of America Jerry Ordway, who had inked the series since its start, became the penciler as of issue #19 (March 1983). He and Thomas co-created the Infinity, Inc. team in issue #25 (Sept. 1983). All-Star Squadron #32 (April 1984) and #33 (May 1984) detailed how the Freedom Fighters traveled from Earth-Two to Earth-X. Several issues of the series detailed origins of various characters including Amazing-Man, Starman, Doctor Fate, Liberty Belle, the Shining Knight, Robotman, Johnny Quick, and the Tarantula. All-Star Squadron #1 contains "An Open Letter to the Readers" written by Roy Thomas. In it he describes the impetus for the series, namely, DC wanted a comic book telling tales of the Justice Society of America. The last series to do so was All Star Comics, which lasted only seventeen issues, ending in 1979. As Roy Thomas put it, DC management gave him "a chance to write a return of the JSA." Instead of writing stories in the modern era, Roy Thomas decided to place the tales during World War II. The setting would be DC's fictional world of Earth-Two, a parallel universe to the mainstream DC continuity established during the 1960s, to explain how DC characters who were well established having adventures in the 1940s could still be in their 30s in contemporary comics. The cast of characters would include a large ensemble of heroes from both the DC stable and the Quality Comics Group (which had been purchased by DC). With so many characters to choose from, the creative team decided to concentrate on "quite promising characters who have been ignored or underplayed for years," instead of those Earth-Two characters who had counterparts on Earth-One. Roy Thomas writes, "If we lost the original GL, we gained the Earth-Two Robotman; if we dropped Jay (Flash) Garrick, we picked up on Johnny Quick; Liberty Belle could stand in for Wonder Woman till more super-powered ladies came along. We even tossed in an Earth-Two version of the venerable Plastic Man, whose series in Adventure was just folding…"
The All-Star Squadron was an example of "retroactive continuity" or "retcon", as it rewrote the already-established history of DC superheroes that had been published during the 1940s. The first known use of the term "retcon" was by Roy Thomas in the letter column of All-Star Squadron #20 (April 1983). Several story lines ironed out continuity errors, fleshed out characters' origins and rewrote earlier stories to explain inconsistencies in character development, resolve lingering questions or fill in missing details. The Trylon and Perisphere, actual structures constructed in Flushing Meadows, Queens, New York for the 1939 New York World's Fair, housed the Squadron's headquarters. The Perisphere contained the Squadron meeting hall, while the Trylon was retrofitted as an aircraft hangar/vertical launch platform. The All-Star Squadron had a robotic butler named Gernsback, who was based on the Elektro robots from the fair and was named after science fiction publisher Hugo Gernsback. After the 1985 DC Comics storyline Crisis on Infinite Earths merged the various parallel worlds DC had established over the decades into a single universe, the older, "Golden Age" versions of DC's mainstream heroes were largely eliminated from continuity. The All-Star Squadron was left only with the characters unique to that time period. Superman, Batman, Robin, Wonder Woman, Aquaman, Green Arrow, Plastic Man and several other heroes were no longer extant at that point in history, and had thus never been Squadron members. In part to clear the slate after the events of Crisis on Infinite Earths and to re-launch the franchise, All Star Squadron was canceled with issue #67 and replaced with a successor series, Young All-Stars. The principal characters featured in Young All-Stars were considered spiritual and contextual analogs for the missing characters: Iron Munro for Superman, Fury for Wonder Woman, Flying Fox for Batman, Dan the Dyna-Mite for Robin, and Neptune Perkins for Aquaman. Evil analogs were also created for the missing characters at the same time: Übermensch, Der Grosshorn Eule, Fledermaus, Usil, and Sea Wolf. Young All-Stars was published for 31 issues and one annual. In a nod to the original JSA adventures in All Star Comics, writer Roy Thomas tried to include at least a cameo appearance by the Golden Age Hawkman in every issue, since Hawkman was the one hero to appear in every Golden Age issue of All Star Comics, including the two pre-JSA issues. Unfortunately, the artwork for issue #49 was printed without Hawkman's cameo included, so it became the only issue to break the streak. The string of appearances had already been broken several issues into a mid-1970s revival of All Star Comics. When writer Gerry Conway revived the Justice Society in their own regular series in 1976, he initially intended to have the younger members of the group, including Power Girl and the Star-Spangled Kid, spun off into their own team and potential series of their own, to be called the All-Star Squadron. The group's name was subsequently changed to the Super Squad, after management at DC worried that the team's original name would be abbreviated as A.S.S. The All-Star Squadron battling Captain Marvel. Art by Rich Buckler. On the day of the bombing of Pearl Harbor, President Franklin Roosevelt gathered available superheroes—including members of the Justice Society of America, Freedom Fighters, Seven Soldiers of Victory and solo heroes—at the White House. He asked them to band together for the war as the All-Star Squadron to battle sabotage and keep the peace on the home front during World War II. The rationale for not using the Squadron in combat situations in the European or Pacific Theaters of War was that Adolf Hitler had possession of the Spear of Destiny, a mystical object that gave him control of any superheroes with magic-based powers or a vulnerability to magic (including Superman, Green Lantern, Doctor Fate and others) who crossed into territory held by the Axis Powers. At the time, many of the Justice Society members had been captured by the time-travelling villain Per Degaton with the help of JSA foes he had pulled back in time, but the available heroes were asked to first guard against a potential attack on the American west coast. Degaton himself used some stolen Japanese planes with hypnotized troopers to launch such an attack on San Francisco, hoping to change history by making the United States fight to a stalemate against Japan, enabling him to take over the world, so the new Squadron's first major mission was to stop the attack and rescue the captured heroes, who also became part of the new group. Due to Per Degaton going back in time after the JSA were freed they forgot his involvement, though the events were not wiped. America's entry into the war caused several of the members of the JSA to enlist, or be drafted in their civilian identities. These included Alan Scott, Starman, Hawkman, The Atom and Johnny Thunder. ^ Catron, Michael (June 1981). "Thomas Revives WWII Superheroes". Amazing Heroes. Stamford, Connecticut: Fantagraphics Books (1): 28–30. All-Star Squadron, DC's new World War II-era superhero series debuts in May in a 16-page preview insert in Justice League of America #193. ^ Beatty, Scott (2004). "All-Star Squadron". In Dougall, Alastair (ed.). The DC Comics Encyclopedia. London, United Kingdom: Dorling Kindersley. p. 11. ISBN 9780756605926. ^ Thomas, Roy (March 2011). "'I Want To Do It All Again!' Roy Thomas Talks About The 1980s at DC Comics – Schwartz, Warts, And All". Alter Ego. Raleigh, North Carolina: TwoMorrows Publishing. 3 (100): 22. ISBN 978-1-60549-031-1. ^ Manning "1980s" in Dolan, p. 198: "The Justice League of America teamed up with the Justice Society of America on a large-scale with 'Crisis on Earth-Prime', a five-part saga that crossed from the pages of Justice League of America into All-Star Squadron...A collaboration between writers Gerry Conway and Roy Thomas, and artists Don Heck and Adrian Gonzales, the saga also featured cover artwork by DC luminaries George Pérez and Joe Kubert." ^ Manning "1980s" in Dolan, p. 203: "The children of the original Justice Society of America made their smash debut in this issue by writer Roy Thomas and penciler Jerry Ordway...All-Star Squadron #25 marked the first appearances of future cult-favorite heroes Jade, Obsidian, Fury, Brainwave Jr., the Silver Scarab, Northwind, and Nuklon." ^ a b c Markstein, Don (2010). "All-Star Squadron". Don Markstein's Toonopedia. Archived from the original on April 4, 2012.